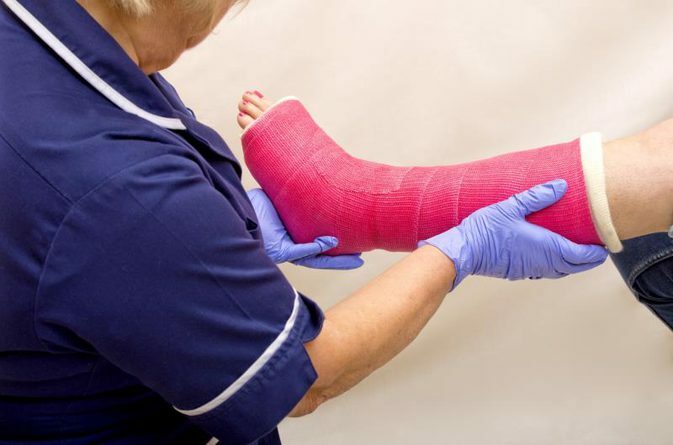 Also referred to as an ankle fracture, a broken ankle involves damaged bones and ligaments in the ankle joint. Symptoms include severe pain, swelling, bruising and inability to carry weight on the foot. A broken ankle can take several weeks or months to heal. During recovery, you will need to stay off the ankle to ensure proper healing. Although you should avoid exercising the injured foot, there are a variety of other exercises you can perform while in bed from a broken ankle. When you are on bed rest after a serious injury, range-of-motion exercises are vital for maintaining the health and integrity of your joints. When done regularly, ROM exercises keep your joints flexible, maintain muscle strength, increase circulation and prevent blood clots. When doing ROM exercises, begin at your neck and work down to your toes. These exercises simply involve moving the joints in every possible direction. For example, exercising the neck involves pulling your chin to your chest, tilting your head back to look up at the ceiling, looking from side to side and dropping the ears to the shoulders. Along with the neck, ROM exercises should be performed on the shoulders, elbows, forearms, wrists, fingers, hips, knees and ankles. While recovering from a broken ankle, avoid ROM exercises on the injured leg. After a broken ankle, you will likely need to avoid exercising the injured leg. However, these leg exercises can be performed on the healthy leg. While lying flat in bed, bend your knee and press your foot flat against the bed. Slowly slide your heel along the bed toward your buttocks. Then, slowly slide the foot back to starting position. In this same bent-leg position, slowly slide your foot out to the side and then back to center. Extend your leg straight with your foot flexed. As you tighten the muscles in your thigh, bend your knee and draw it toward your waist. Use your arms to hug the knee to your body for up to five seconds before returning to starting position. For many people, abdominal exercises can easily be performed from bed. However, if you typically tuck your feet underneath the couch while working your abs, it may be difficult to perform these exercises with a broken ankle. Begin by performing 10 to 20 traditional crunches. Then, modify the crunches to work your oblique muscles. With your hands behind your head, bring your elbow to the opposite knee every time you crunch forward. Slide your hands underneath your buttocks and extend your legs straight on the bed. Use your abdominal muscles to lift your uninjured leg toward the ceiling. Hold for two to three seconds and then slowly lower back to the bed. Repeat 10 times. Lying on your back, extend one arm toward the ceiling with the fingers pointed. Slowly draw 10 small circles in the air in a clockwise direction and then 10 small circles in a counterclockwise direction. Then, draw 10 large circles in a clockwise and counterclockwise direction. Repeat with the other arm. If you are only recovering from a broken ankle, you should be able to perform simple arm exercises with light weights from bed. Exercise ideas include overhead triceps extensions, shoulder presses, chest presses and bicep curls. For the next article in the series: click here >>What is Cuboid Syndrome?